For nature lovers and active vacationers, Northern California is heaven. 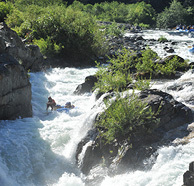 Whitewater rafting northern California has some of the most exciting rapids to be found anywhere in the country. From the stunning granite peaks of Yosemite Valley to the placid blue waters of Lake Tahoe, one can find a vast array of options for camping, hiking, boating, rock climbing, biking, and more. In just a few hours’ drive from the San Francisco Bay Area and Southern California coast, you can find some of the West Coast’s most beautiful and unique natural environments. It’s a destination for just about everything outdoors, including river adventures. If it’s the rush of the rapids you’re looking for, you should know that white water rafting in Northern California begins with the American River. This 119-mile long gem of inland Northern California runs from the Sierra Nevada mountain range until it converges with the Sacramento River in the San Joaquin Valley. Ranging through old Gold Rush territory, stunning geological formations and wildflower dotted wildernesses of the Sierra foothills, the American River has three popular sections. 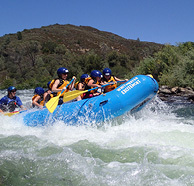 The South Fork of the American River is one of the most family-friendly destinations for river rafting in Northern California. With Class 3 rapids, the South Fork is a fantastic starter run for beginner and intermediate rafters – exciting, but not too intense. The South Fork meanders through some beautiful scenic areas, including Coloma State Park, where gold was first discovered in California. If you’re looking to accommodate a diverse group with varying levels of physical ability, the South Fork is the Northern California white water rafting trip for you. Check out our South Fork ½-day, Full Day, and 2-Day rafting trips. The Middle Fork of the American River is a step up in adventure. Featuring Class 4 rapids through a beautiful, isolated canyon, the Middle Fork promises some real thrills and a solitude on the river that is truly unique. Check out our Middle Fork ½-day, Full Day, and 2-Day rafting trips. Unlike the hydro-dam controlled South and Middle Forks, the North Fork is a naturally flowing river that is highest during springtime snowmelt. It is the most intense and technical of the American River sections, with crystal clear waters, steep gorges and endless rapids. You must be in good physical condition and have previous river rafting experience to take on this section of the river. Check out our North Fork ½-day, Full Day, and 2-Day rafting trips. Located 3.5 hours from San Francisco and 6 hours from Southern California, the Merced River flows from the peaks of Yosemite National Park. When the lupine, redbud and poppy bloom in spring, you’ll find some roaring Class 4 rapids along the river’s 18-mile stretch. You should be in good physical condition and ready for adventure to take on this pristine example of exciting white water rafting in Northern California. Check out our Merced River Full Day rafting trip. Our knowledgeable, fun and attentive guides have been leading white water rafting trips in Northern California for almost forty years, and we’re continually receiving great testimonials from our guests. We love what we do. We love to create great river rafting experiences for our guests, who come to us from all over the world and with all different skill levels. In addition to our usual trips, we are happy to customize a river adventure for you. We love the river. Our guides know these waters like the lines in their palms. Even our company’s founder, an experienced river guide, still leads trips down the river! There is no Northern California river rafting company more invested in providing you with a great river vacation than Whitewater Excitement. Our accommodations rock. Guests stay at our private riverside campground, which offers modern bathroom facilities (hot showers, flush toilets) and a pristine view of the river. We don’t use public campgrounds or off-river sites for our trips. 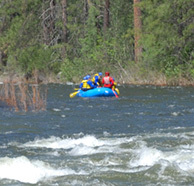 Want to go whitewater rafting Northern California – but unsure how to get to us? Call us at 1-800-750-2386 to reserve your trip dates and get recommendations on transportation and local lodging if needed. Unsure what rafting trip would be best? Check trip availability with our online form and receive a response from us within 24 hours.